Human hands are marvelous lifelines. They give us the ability to interact with the world, communicating ideas, showing affection and so much more. You might never take the time to examine all the different working parts that go into the hand and how it functions—until pain or injury makes even those small movements uncomfortable, excruciating or simply out of reach. Because hands are so vital to our everyday lives, many physiotherapists and occupational therapists have dedicated their practices to this one part of the body. They offer hand therapy for a wide range of injuries and conditions, helping clients of all ages and backgrounds regain the ability to grab (and hold) onto life once more. How does the hand work? The human hand is a complex structure made up of 27 small bones, over 30 muscles, along with joints, ligaments, tendons, nerve fibres, blood vessels and connective tissues. That’s a lot of working parts for such a small area, especially one that’s only protected by a thin layer of skin. The complex structure of the hand gives us a great range of motion and accuracy, but also brings a lot of vulnerability. Each finger has three joints, two of which move only one way (bending and straightening). The thumb also has three joints, one of which has enhanced motion capability. The carpometacarpal joint (thumb or carpometacarpal joint), can rotate as well as flex and extend. The thumb, in conjunction with the radiocarpal joint (wrist joint), function together, allowing us to flex and extend the whole hand. Hand therapy is a form of physiotherapy and occupational therapy that focuses on the assessment and treatment of injuries and conditions of the hand and arm, optimizing its functional use. Given the complexities of the hand, having a having a therapist with advanced training in the hand/upper extremity to treat your injury or condition ensures your recovery is fueled by targeted experience and knowledge for this important part of the body. 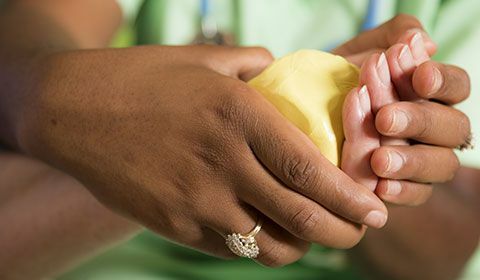 A hand therapist is a licensed physiotherapist or occupational therapist who have extensive experience treating hand and arm injuries and conditions. Many of these clinicians are certified hand therapists, meaning they have completed the required education, logged hours of experience with other experienced therapists and have passed a Hand Therapy certification exam. Hand therapists are trained to assess and treat conditions of the hand and arm that result from trauma, disease, congenital or acquired deformity, providing custom treatment plans to return people to optimal hand function. Hand therapy can treat a wide range of hand injuries and conditions brought on by acute trauma, repetitive overuse injuries and acquired conditions. It’s common for your hand therapist to work directly with your hand surgeon, both before and after surgery. The benefits of these treatments include decreased pain and increased range of motion, as well as improved strength and functionality. A return to normal activity is the ultimate goal of hand therapy. Hand therapists often treat those with carpal tunnel syndrome, which is described as numbness, tingling, weakness and other functioning problems in your hand. The median nerve, which controls the feeling and movement of your thumb and first three fingers, runs along your forearm to your hand through the carpal tunnel, a small space in your wrist. A build up of pressure on the median nerve causes carpal tunnel syndrome. 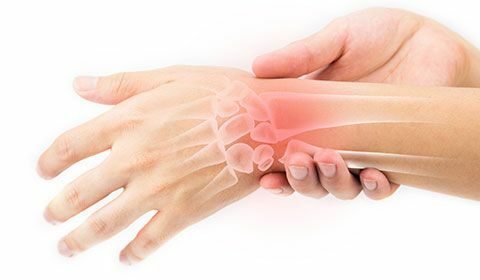 Beyond the symptoms described above, a telltale sign of carpal tunnel syndrome is having problems with all fingers except your little or pinky finger, since that finger is connected to a separate nerve. 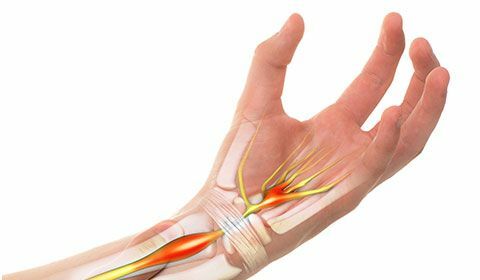 For mild pain and symptoms of carpal tunnel syndrome, treatment may begin at home with RICE (rest, ice, compression, elevation), anti-inflammatory medications and wearing a simple splint. Simple exercises, including hand therapy ball exercises, may help with strength, range of motion and pain relief. Check out 10 Ways to Exercise Hands and Fingers. However, if symptoms continue longer than a few days or get worse, you should seek treatment from a physiotherapist or occupational therapist, ideally someone with advanced training in hand therapy. They will assess your condition and develop a custom treatment plan to reduce pain, increase strength and improve function of your hand. If necessary, they’ll also equip you with strategies to prevent re-injury, with work or home activity modifications. Most individuals see improvement after several weeks of hand therapy. If this is not the case, or if there are signs of nerve damage, surgery is an option. 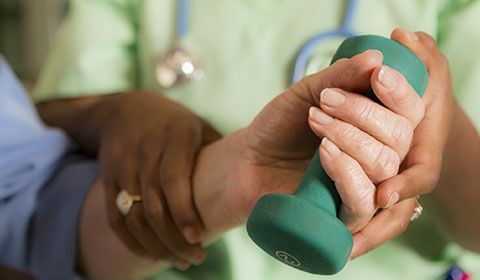 A hand therapist, who will work directly with your doctor, can assist with your post-surgical rehabilitation, helping increase the speed and effectiveness of your recovery and preventing re-injury.